Fan’s of the TV series Supernatural will recall this was the first episodes theme. Alongside various tales of hitch-hiking females they often have one thing in common, being betrayed by their husband or partner. The White Lady reports are a a global phenomena, there is no one hotspot so I just picked some of interest. 1.The White Lady of Willow Park, Newton-Le-Willows in Merseyside, England. She’s thought to be the spirit of a bride who was drowned in the lake by her husband on their wedding night. 2. Union Cemetery in Easton, CT has had reported sightings of a White Lady since the late 1940’s. She’s said to haunt the nearby Stepney Cemetery in Munroe, CT.
3. Rusalka, a Slavic Mythology, says the ghost of a woman who died violently, jilted by the lovers and they are usually pregnant when they died. 4. “Den Huite Dame” is said to reside at Fredriksten Fortress, Halden, Norway. She was the Fort Commander’s mistress. Her lover was killed by a cannonball when Swedish Forces attacked. His remains were never found and she committed suicide jumping off the fortress walls. It’s said she will appear near the White Tower at midnight. This is a tragic tale (and I will advise you that searching online gets some sadly upsetting pictures) of a young boy whose murderer was never identified. 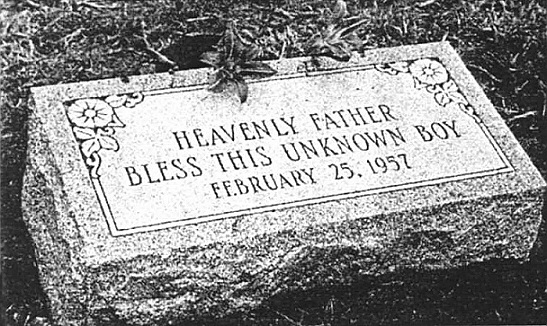 The young man himself was around 4-6 years old and was found in a cardboard box Feb 25th, 1957. A young man was checking his muskrat traps, fearing the police would remove the traps he never reported the sighting of the dead boy. The body lay in a blanket, inside a box for a few more days until a college student was driving that way. The student spotted a rabbit running into the bushes and stopped the car to check it was not caught in the traps. What he found was the body and after deliberation he reported it the next day. Despite print-outs of the poor boy being distributed and large campaigns, no information about him came forwards. Theories have been abundant and stories about his conspirators letting him wind up where he did. Regardless of this the case remains unsolved. Rest in peace little man, the murderer(s) surely will not.